Our recruitment is currently closed for general Volunteers. If you would like to volunteer in any of our Tea Bars at BRI or St Luke’s or for the Ward Trolley at BRI please contact the office on 01274 364309 or email volunteer.information@bthft.nhs.uk. Please note that these roles are available Monday to Friday 9-4 only. Thank you for your interest in Volunteering at BTHFT. Please check this page again for our future recruitment. Our volunteers are a vital part of the team, and help us deliver the highest standards of healthcare. We simply could not operate as well as we do without them. The Trust has an active volunteering community which continues to grow significantly. We currently have more than 450 people who give their time freely to help patients, staff and visitors and give something back to their local community, and we run regular recruitment drives for prospective volunteers. On average, each volunteer donates four hours of their time each week – a total of 104,400 hours each year! We welcome volunteers from all abilities, backgrounds, cultures and beliefs – and are keen to hear from prospective volunteers. Volunteers provide an invaluable service through a variety of support services and activities and make a huge difference to the care that our patients receive. Our volunteers offer a tremendous contribution in support of patients and staff at Bradford Royal Infirmary, St Luke’s Hospital and at our community hospitals. 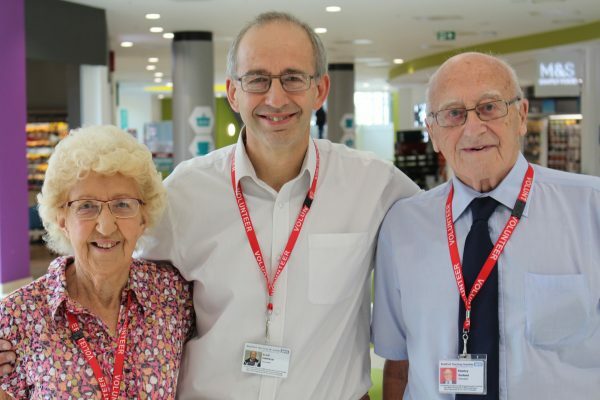 The Sinfields have been volunteering at BTHFT for almost half a century. Dad Stanley, 93, is BRI’s oldest volunteer, closely followed by wife Joan, 91. The couple have been joined on the wards by son Alan, 57, a retired telecomms manager. Please click here to download our FAQs and answers. Anyone aged 17 and over can apply to become a volunteer. There is no upper age limit. We welcome people with disabilities and people from all cultures and backgrounds. We don’t ask for qualifications – all that we ask is that applicants are fit and well enough to undertake the volunteer role of their choice and that they have a genuine interest in helping others. We provide the necessary training and support and view our young volunteers as the potential NHS workforce of the future. Usual practice involves coming in to volunteer once a week for two-to-three hours, on the same day and at the same time each week. Please bear in mind that recruitment takes place two-to-three months prior to commencing a volunteer placement. People aged 25 years and over tend to be the volunteers who stay with us on a long-term basis. Volunteers in this age group are welcome to apply during any one of our recruitment phases, providing they are fit and well enough to undertake the role they have chosen, but must be able to commit to a minimum of six months. Many stay for much longer! Anyone aged 17 or over is very welcome to apply to become a volunteer at Bradford Teaching Hospitals. Most young people apply to become a volunteer because they have an interest in working within healthcare as a doctor, nurse, or allied health professional, or within one of the many non-clinical support roles such as porters or catering assistants. While it is not possible to volunteer in all of these areas, our Patient Support Scheme provides a good introduction to working within a hospital setting, and volunteers will be able to relate much of their experience to their prospective career. Other volunteer roles beneficial to students and other young people include hospital radio and the play assistant role. Volunteering within Guiding Services is also a good way to improve knowledge of NHS services and build confident communication skills. Young volunteers must be able to commit to a full, consecutive period of six months. Applicants will be selected using the process detailed on the ‘Completing your application form page’. All applicants will be shortlisted from information provided on the application form and, if successful, invited to a group interview. Applicants successfully shortlisted from the group interviews will be required to attend a final assessment/induction. Thank you for your interest in volunteering at Bradford Teaching Hospitals NHS Foundation Trust. The volunteering window is currently OPEN! If you are interested in volunteering with us, please complete and return the application form to us by the closing date of Sunday, February 17. Forms may be completed online or printed, completed by hand and returned by post. The address details are included in the information sheet attached to the form. Please note that if your application is successful you will be placed in a volunteer role where you are most needed. Many thanks for your interest in volunteering with us and good luck!